She came, she saw, she blew our lives to bits and now she’s gone. Yes, that was Storm Doris. I’m sure I speak for all readers when I say I’m glad to see the back of her. 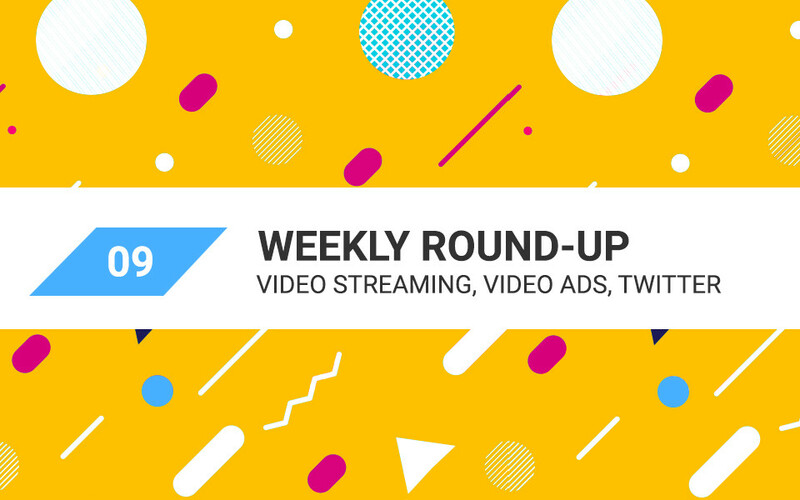 It’s time for this week’s digital marketing round-up and that means delivering some of the latest tips on how you can get the most out of your social channels. This weekend, we are starting with yet another reminder that if you are not including video in your digital marketing efforts you are not putting your best foot forward. According to Tubular Insights, over 7.9 million videos were uploaded to Facebook in January 2017 alone, and they generated 242 billion views and gained an average engagement rate of twice the norm. No surprises there, given what we have been saying about the importance of video. Only in 2014, Facebook CEO, Mark Zuckerberg, stated “In five years most of [Facebook] will be video”. That certainly seems to be coming to fruition. More importantly, also during January 2017, Facebook’s 1.86 billion monthly active users demonstrated very clear video viewing preferences. News and current events, lifestyle, and viral/entertainment-based clips are more likely to be shared as they relate to it and this type of content is a way of expressing who they are and their personal preferences. 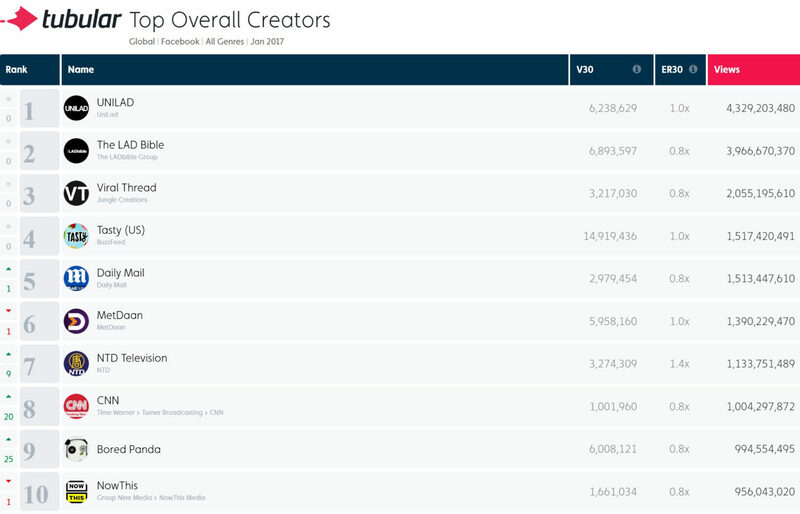 Tubular Insights published a Top 10 Facebook Publishers chart for 2017. A quick glance at the results in the table below gives a very quick insight into what people are wanting to view. I’m certainly delighted to say that the publishers in the Top 3 are all from the UK. If only we could do this well in our footballing efforts! With over 10 billion views between them, UNILAD, The LAD Bible and Viral Thread have captured just over 4% of all of January’s video views. Marketers take heed. Users of Facebook at least are letting you know exactly what is going to grab their attention and what isn’t. Remember the “Percentage Completion” Factor? Not long ago, we reported a change in the way Facebook would be ranking videos that appear in newsfeeds, with an emphasis on “percentage completion”. Just to recap on that, Facebook will rank your video higher if people tend to view more of it before taking their attention elsewhere. Percentage completion works against longer videos because if somebody zones out after watching 20 seconds of a video that is only 30 seconds long, that is still 66% of the whole video. Had that video been a 5 minute tutorial, switching off so quickly would be damning. Viewers would only be seeing a fifteenth of the entire video! The smart money is therefore on creating shorter, more engaging videos that people are more likely to want to watch until the end. For those wanting to publish longer videos, they will have to make much more of an effort to ensure people watch at least most of the video before tuning out. This is certainly the case for native videos that are uploaded to Facebook, however the situation is different for those using Facebook’s Live video Streaming facility. People are spending three times longer watching live streaming videos than native videos so including Facebook Live Video within your digital marketing strategy would make good sense. The longer people continue to watch a live streaming video the more engagement you will receive as it will reach more newsfeeds. It’s a bit like a marketing rodeo except nobody will actually kick your video off the platform. You certainly don’t want your exploits to die a death though. Facebook advise that we livestream for at least 20 minutes however it is possible to do so for up to four hours. Tubular Labs reported that four of the top five most-watched Facebook Live streams were over three hours long. Food for thought? 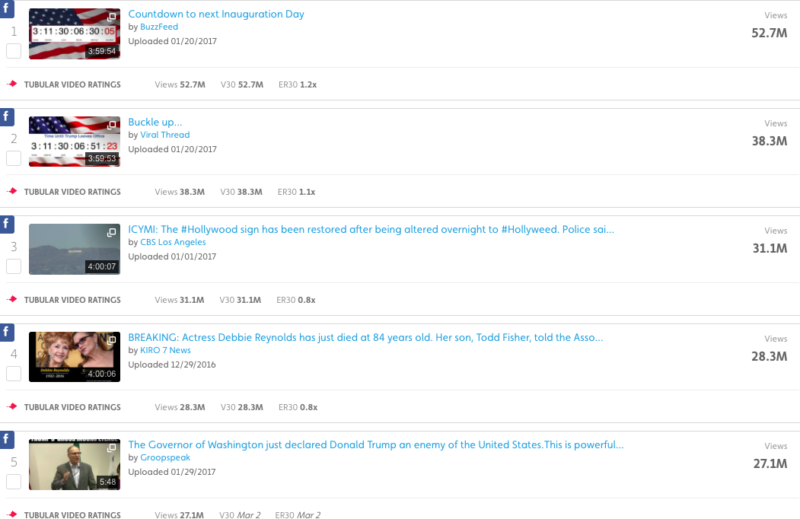 And tuning into the public’s hunger for news and current affairs, perhaps, the most viewed was “Countdown to the 2020 Presidential Election” from Buzzfeed, which generated 50 million views within the first few days! Furthermore, this particular video is still generating around 14,000 new views per day, three months after it was originally live-streamed. What are the best practices for Facebook Live Video? Over in the US, eligible video creators will be able to insert 20-second ad breaks four minutes into live streams with at least 300 concurrent viewers. Facebook have actually been testing mid-roll ads within live videos since last August, and now they are throwing it out to video creators to use. Clearly this is a great way for publishers who are creating popular content to monetise their activities. As we have said many times in our weekly roundup, if it is happening over in the US, it is quite likely to happen over here, so work on making your content as engaging as possible. You, too, could be earning from mid-roll ads at some time in the future. Well, in what will probably turn out to be a storm in a tea cup, the UK’s Independent newspaper reported that users were accusing Twitter of ghost-deleting tweets. Twitter had recently announced a new raft of safety measures to help protect users from abuse, including a feature called “safe search”. Safe search, however, is only supposed to hide tweets containing “potentially sensitive content” and tweets from blocked and muted accounts from users’ search results. The tweets would still exist and would not be deleted. However, one Twitter user, @SuperNerdCow, claimed that Twitter had effectively deleted one of his tweets by making sure nobody else could see it at all even though he still could. The tweet in question contained the hashtag, #NotTheEnemy, which is a term often used to deride “social justice warriors”, although in the tweet concerned, it was used in the more conventional sense. Twitter deny deleting the tweet and say it was accidentally marked as spam. What do you think? Has this happened to you or anyone you know? That’s all for this week’s round-up folks. Let’s see what the world of social media (and the weather) throws up over the next week. Remember, if you need any help creating high quality video content or advice on content marketing that works, MSA is here to help. All you need to do is get in touch.